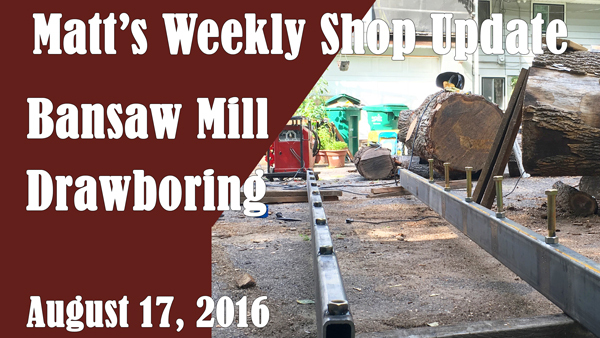 Getting started on the frame that will support the logs and guide the carriage. Before the frame can be welded holes need to be drilled and tapped to attach the stainless steel runners and holes need to be drilled on the underside to receive the leveling bolts. That’s 54 5/16″ holes and 27 15/16″ holes. Alternative title: Matt Drills a lot of Holes. Is that spot on your yard the final location? 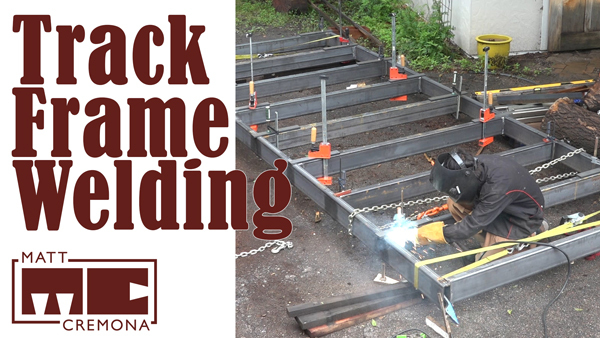 How much preassembly and welding are you planning to do before it is moved to a permanent foundation? Just watching you lug around those heavy cross members – fully assembled that thing will be super heavy! I agree it still is woodworking – we all are still paying attention and enjoying it. Thanks Billy! oh yes, I’ve gone through quite a lot of oil already. I have done this with wood when I want to enlarge a hole and can’t use the pilot bit on the hole saw: Get a flat piece of metal, drill the hole with your hole saw. Take the metal and place and clamp it over the hole you want to enlarge, and use it as a guide for your hole saw. Great tip! Thanks! Makes me also wish I was able to find a replacement hole saw that day. Is that the slowest drill press speed? Good luck! Yes, it bottoms out at 500rpm. Thanks! Matt you need a mag drill for all these metal projects. Please let me know if yo;1782&#ure looking for a writer for your site. You have some really great articles and I believe I would be a good asset. If you ever want to take some of the load off, I’d really like to write some content for your blog in exchange for a link back to mine. Please shoot me an e-mail if interested. Cheers! Matt, you need a stepped drill bit for metal.. It drills each step until you hit the correct diameter. Also be careful with the Ryobi drill press – I managed to burn out the wiring in mine drilling a series of 25mm holes. Holey Cow! The good thing is no harm. I would have to edit out my expletives. I might suggest slowing the bit down little more if you have a lot of holes to do, to keep the bit cooler and last awhile longer. ( I trained to be a machinist) A lot of patience taught by my mentor Murphy! haha I think it happened too slowly for swearing to come out of me. I’m running everything at the slowest speed that I can. Holes in the stainless is next but those are back on the drill press.